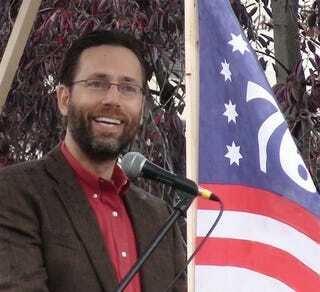 Alaska GOP U.S. Senate candidate and Tea Party favorite Joe Miller. Alaskan GOP candidate and Tea Party darling Joe Miller is on that stuff. Last month, the U.S. Senate candidate said that unemployment benefits are unconstitutional. "The unemployment compensation benefits have gotten — first of all, it's not constitutionally authorized," he said, adding, "I think that’s the first thing that's gotta be looked at." We won't even touch if it's "constitutionally authorized" to pay into them but then have to apply to get the benefits when actually unemployed — or be prevented from getting them because of politics — but we digress. On CBS’ Face the Nation, Miller, who is ahead of incumbent Lisa Murkowski in Alaska's U.S. Senate GOP primary, suggested privatizing Social Security and phasing out Medicare. He also doesn’t think that human behavior contributes to climate change. Uh-huh. Excuse us while we go and count our pink hearts, yellow moons, orange stars and green clovers as we ease on down the yellow brick road.